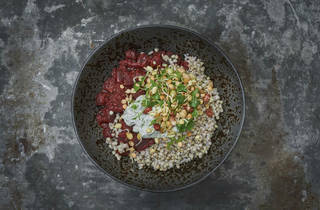 A stylish healthy-eating joint with plenty of ‘free-from’ options. 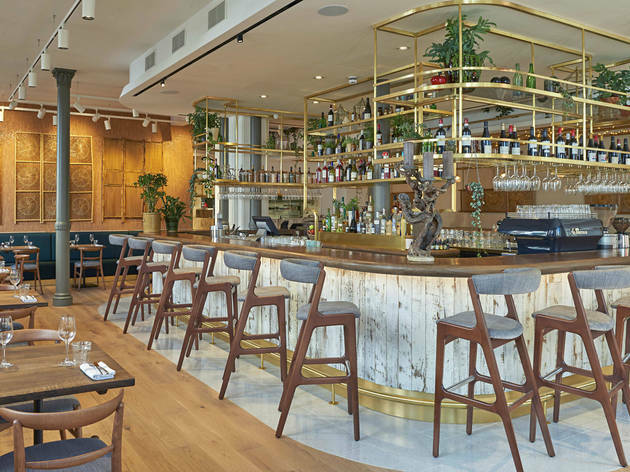 If Jay Gatsby had fled West Egg for the beaches of Bali, his new home would probably look a lot like west London’s latest health food spot. Farmacy (as in health from the farm, geddit?) is free from most things – dairy, refined sugars, meat, additives and chemical nasties – though happily, not taste. In fact, it’s packed with all kinds of taste, from the food coming out of the kitchen to the ultra-sleek décor. 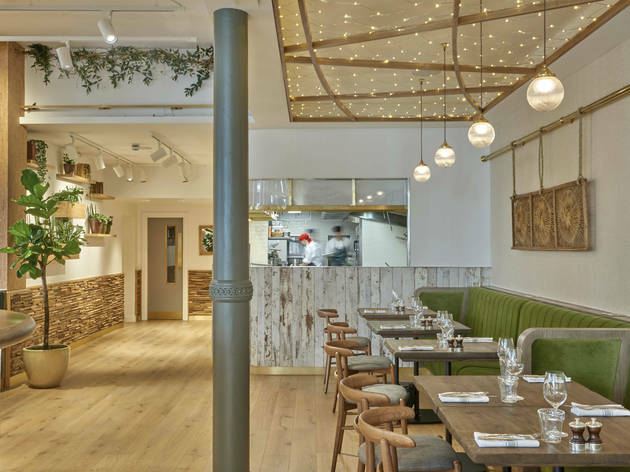 Despite being a vegan-friendly restaurant there is a reassuring lack of hemp, and pretty bamboo is tempered with beautiful brushed gold. It’s smart, to be sure, but the atmosphere is relaxed and the staff are really friendly and, more importantly, not at all stuck-up. 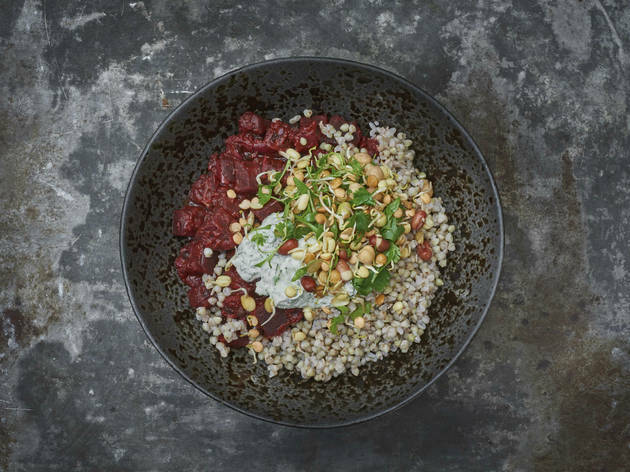 Farmacy boasts ‘clean indulgence’, which means that the menu has lots of naughty-sounding but actually super-healthy things to choose from. The mushroom tagliatelle, made with spelt flour, had a good bite to it and the truffle sauce was rich and earthy without being sickly. Their eponymous burger had a nice, nutty texture and was loaded with avocado pickle, so despite being vegan it was bicep-curlingly meaty. And chips on the side were delicious proof that you don’t need animal fat to fry a potato. A good vegan dessert is harder to come by than the 347 bus, and the brownie sundae here doesn’t cut it either. 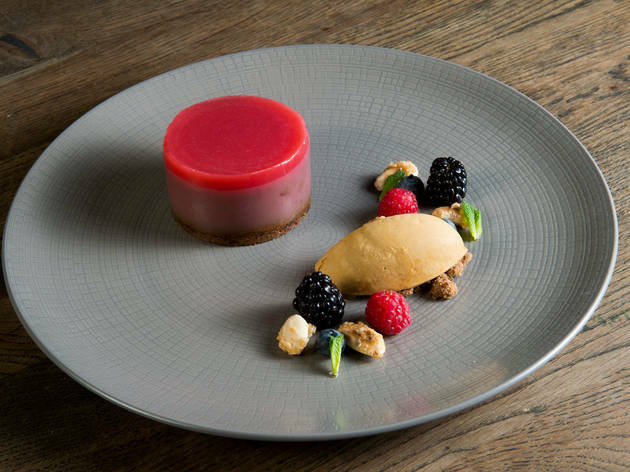 Instead, order the brilliantly zingy lemon cheesecake; light and creamy but with the kind of biscuit base Gregg Wallace would appreciate. All-in-all, it’s a crowd-pleasingly delicious spot – go with a group and make sure to invite that one picky friend who’s currently cutting something out of their diet. Leave the over-indulgence to Gatsby’s gang. 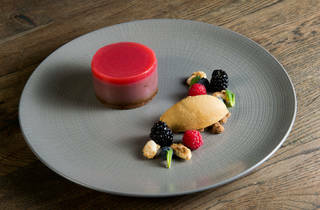 Dinner for two with drinks and service: £90. Delicious and fresh tasting food. This is a vegetarian  restaurant so meat eaters beware. The service and staff were pleasant with an enjoyable ambience. Highly recommend a visit and feeling the glow of rainbow colours when you leave. I absolutely love the Farmacy! The decor, ambience, staff, & of course the food, are all impeccable. I’ve just visited this restaurant three times in three days - that’s how much I love it! It’s most definitely my favourite restaurant in London, & one of the few restaurants that easily caters for my dietary restrictions. I can eat here safe in the knowledge that I’m not eating anything I shouldn’t, & every dish is just so delicious. The service is always efficient & I’ve never had to wait long for my food to arrive. Also, the staff are obviously chosen very well. They are classy, professional, efficient, & most of all friendly & I’m always greeted with a smile. I simply cannot fault this restaurant. Well done to all involved! I think Farmacy is the type of restaurant to divide people you either love it or you hate it. I personally love it. I have been to many vegetarian/vegan restaurants and this is one of my favourites. I think its important to remember that the food is vegan so your bean burger will never be a beef burger. However the food is clever and not overpriced. Most impressive in my opinion are the deserts - they are indulgent and delicious. Honestly... This has to be one of the most disappointing food ventures I've had in a while. We came here with our vegan mother for a refreshingly healthy brunch! What we got was healthy alright but extremely bland also! The place was packed so we had to leave our names and reappear 45 minutes later! Surely a wait like this will be worth it right? Long story short the menu here is very healthy and organic. However, there's no excuse for the lack of flavour and seasoning.they aren't cheap And the wait is long .... I won't be back . I'm no vegan, but this place is delicious. The things they manage to pull off her literally had me scratching my head in disbelief. The House Classic Pizzetta (homemade sourdough wth tomato sauce, roasted vegetables, cashew 'cheese' and fresh herbs) literally tastes like a real pizza. 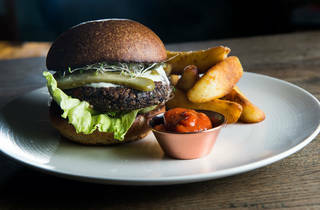 The real star here is their classic burger; a millet, mushroom and black bean burger served with garlic aioli, delicious goji ketchup, avocado, pickles, tomato and potato chips served in a wholemeal vegan bun. I work in the hamburger industry and this was honestly better than some proper burgers I've tasted elsewhere. The restaurant itself is beautiful, with plenty of 'grammable opportunities inside and out. It made me laugh that our lovely waitress couldn't get through the service without dropping the fact that she was a vegan into the conversation (typical vegans! ), but to be fair, when the food's this good you can't blame anyone for shouting about it. I didn't know much of vegan food and when I went to Farmacy for the first time it was a lovely surprise. I loved the food both at brunch and dinner. My friends and I had all seen or heard the hype around Farmacy. Whether it was because we'd seen a Made in Chelsea regular frequent there or we'd read about it on a trendy fitness blog, we all wanted to try the place out. It 100% delivered on the hype. There was no problem getting a table just before 7pm on a Friday night. We breezed in, which meant we were over our first hurdle, as you always worry about a lengthy Dishoom-esque queue at restaurants that don't take reservations. The wine was good value, £5 for a glass of the house and their variety of smoothies and juices left us browsing the menu for ages! We shared the mezze board between three for starter, which was plenty and had a good dip to cracker ratio. For my main I chose a spelt pasta dish, which tasted as good, if not better than regular pasta. It was seasoned beautifully with truffle oil and a mushroom sauce- delicious! For desert we settled for trying some of their famous syringe shots. Although they'd run out of the "Beautify" I settled for a the "O.M.G" which was a fun novelty to finish the meal. If you haven't been yet, definitely check out Farmacy, I'll be going back to try out the brunch very soon! Farmacy; home of the filthiest/cleanest cacao, vanilla, cinnamon, chilli, coconut, nutmeg festive hot chocolate. Also worth noting a £7 hot chocolate - so you pay for the good stuff. 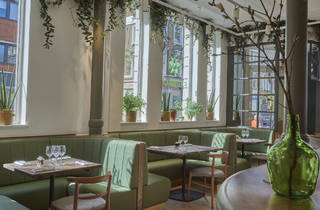 It is a sublimely beautiful interior with a snazzy bar and greenery all around. 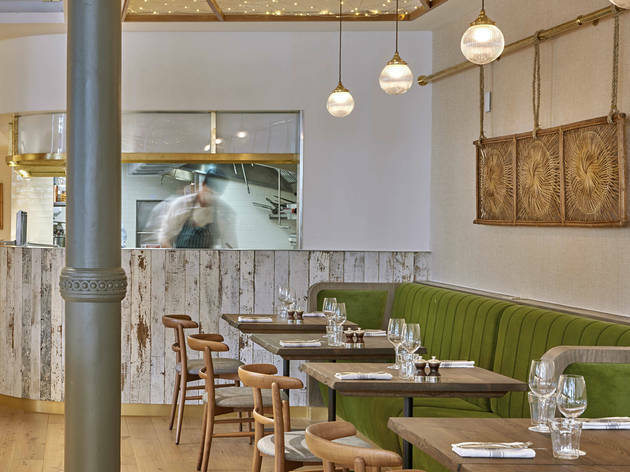 It's light, airy and perfect for lunch and brunch with a nice quiet catch up. I didn't eat here (I mean, you can't exactly have a salad after you've had a hot creamy drink for starters) - but everything seemed nice. I did notice you can't book a table here so it might be better to go earlier in the day when you can guarantee a seat. 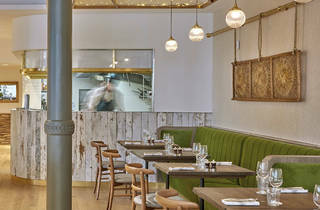 It's an idea place to catch up though and near Westbourne Grove and all the joy that is Notting Hill. Oh and they serve booze too, hey, it's good to know! 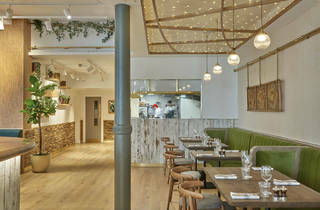 Farmacy is a good-looking place in the prime location of Notting Hill. It occupies a corner of a building so benefits from the extra large windows. 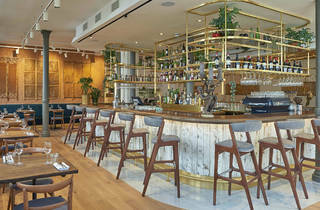 The restaurant is light and airy, with white walls, orangery style greenery all around and brushed gold fittings. Oh, and there’s a gorgeous square bar smack in the middle of the dining room. I would dispense with the rattan decorations on the walls, though. They give off this new age vibe that feels amiss in this posh neighbourhood. We get it: it's all healthy, natural, organic, vegan, karma friendly, etc. No need to oversell this. Now, food. I’ve been vegetarian for ages now, so i know that vegan foods can be thoroughly amazing. Even so, I was impressed. Everything we tried was well above average quality and flavour wise. I particularly liked the caesar salad. It was hearty and crunchy and full of flavour and I have no idea how they managed to emulate the anchovies but they did. The sides and add-ons section of the menu also deserves a special mention from me. It features everything you can think of to build up or customize your main: poached egg, humus, guacamole, frijoles, sauerkraut even! Very generous servings too. On to the wine list. Here too it seems like they are trying too hard. So, the wine list features ‘Biodynamic’, ‘Wines with Minimum Interference’, ‘Certified Organic’ and ‘Practising Organic’ wines to name a few. What’s the difference and why should I care? Our waitress couldn't explain. And it makes it a bit confusing, as you are searching for a glass of white, as you need to look through all the individual categories. I doubt there are that many people who go for biodynamic (as opposed to, say, natural) wine first, sauv blanc second. Finally, all you Instagrammers, make sure you order a syringe shot. It's freshly squeezed juice served in a syringe! Not sure there’s any added value in having it served in a syringe, but it surely makes for some Instagram gold. I was impressed by Farmacy's excellent decor, good atmosphere, delicious food, great service and of course concept! Everything is vegan-friendly, clean, healthy and really interesting! I would expect it to be less of flavour but no, everything was delicious. We had the raw bruschetta for a starter and both the Mexican earth bowl and the chef's clean curry were excellent! I am not sure if it is worth it the long wait though, we had to wait at least an hour. I guess book in advance would be the "cure" to that, or just go a less busy time (we went on a Friday evening). I also found it quite expensive, but I guess it is what it is. We overall enjoyed our evening there. Highly recommended for a special evening to try out something out of the ordinary! Detoxifying, immune boosting, alkalising, liver cleansing – you know you’re in for some sort of healthy spin just from a quick skim of Farmacy’s extensive menu! 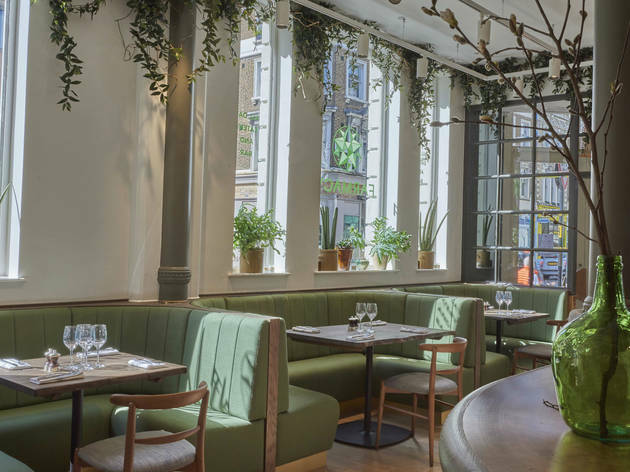 The trendy, plant based restaurant in Notting Hill serves up a great range of vegan and vegetarian dishes, free from refined sugars, dairy, additives and chemicals. And annoyingly reservations. I’m always put off by restaurants with a ‘no reservations’ policy and long wait times. You have to suddenly become oh so tactical about which day of the week and time you choose to go. 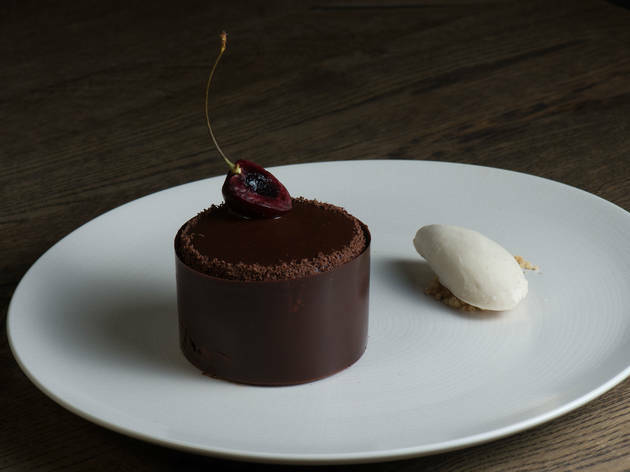 This is how the London restaurant scene is nowadays so my old soul ways need to get over it and get used to it. In the spirit of vegan month, I got myself to Pharmacy! Organic, healthy, global and fresh. 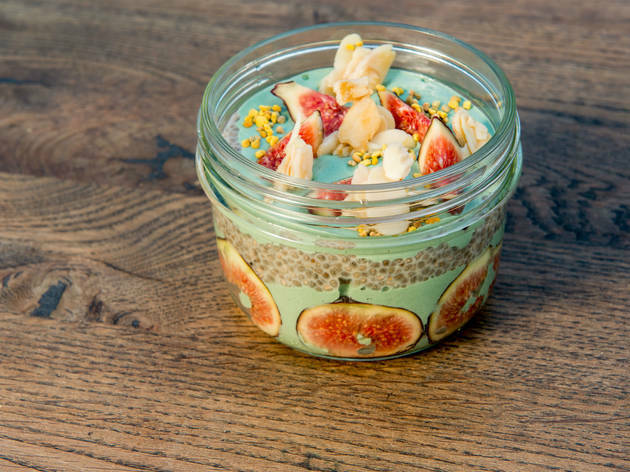 A restaurant catering to all of these clean eating dietary needs is hard to come by! Contrary to what people may think, the food here is delicious as well as indulgent. You won’t leave feeling hungry as if you’ve just eaten a rabbit’s dinner prepared by free spirited hippies! It may not be everyone’s cup of herbal green tea. I don’t think a meat loving carnivore would be completely sold but it’s a fun place to try for a meal that feels relatively guilt-free. 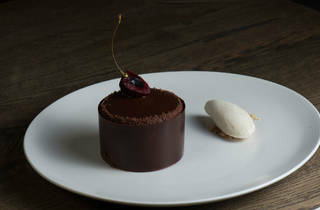 The menu, inspired by dishes around the globe, offers everything from comfort food burgers and pizzas to heavenly earth bowls. The nachos included light and airy chips. They were presented in a spiral with a trio of dips hidden inside. The dips included guacamole, sour cream, beans and a tomato salsa type one. Delicious and tasted so fresh! The sweet potato falafels weren’t like traditional falafels at all, but this was in no way a bad thing! I loved the strong sweet potato and garlicy flavour that’s seeped though from the soft falafels. The burger was flavourful and as good as a burger can be! I really enjoyed the side of thin and crispy sweet potato fries too. I’d definitely recommend trying Farmacy. 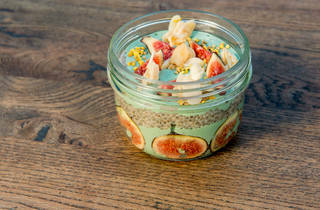 The clean eating fad is here to stay and I’m glad more and more restaurants dedicated to healthy eating are opening and showcasing a clean diet is far from boring. Even if the menu doesn’t tickle your fancy at first, try it – you’ll be pleasantly surprised and if anything, it’s a goodie for Instagram! We only had a takeaway because we were in the area and I couldn't help myself from trying the vegan calzone. The place was very busy with a 30min+ waiting list - looks like business is going very well for them. The calzone was very very tasty but felt a bit too small for the price you pay (I believe it was £12). Would like to try and sit in the place next time, but this place is only for special occasions. What a lovely dining room where you can grab your laptop and sit for hours while enjoying their plant based dishes. The rose tea is delicious and buckwheat pancakes were light and fluffy. If there was a place that could convert me to veganism, this would be it. 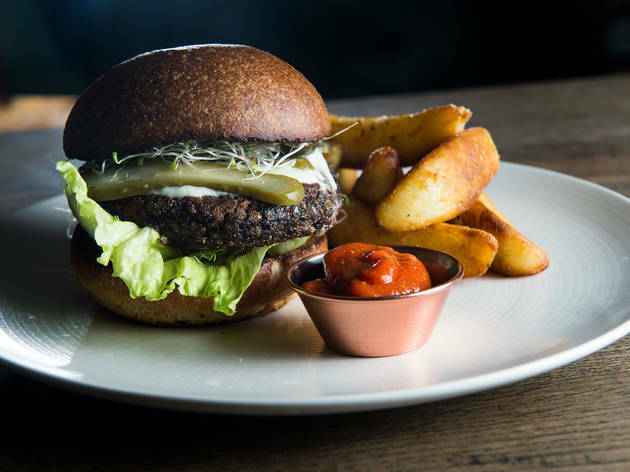 Farmacy is a very cool spot for guilt-free indulgence (seriously, you'll go nuts) and they've done well to create a menu that transforms well-known, meaty dishes into plant-based masterpieces that taste exceptional - like the black bean and mushroom burger. They also do some fab cocktails and smoothies, but get your hands on one of their "syringe shots" - a healthy concoction of vitamin-y goodness that'll knock out a virus cold. For extra pharmaceutical fun, it comes in a syringe. As for value for money, you're not really gonna get cheap eats here - but it's not gonna break the bank either. It's definitely worth rounding up a few pals to make an evening of it, especially if you're new to vegan eating. You'll be impressed.